Enriched with the goodness of Green Apple. 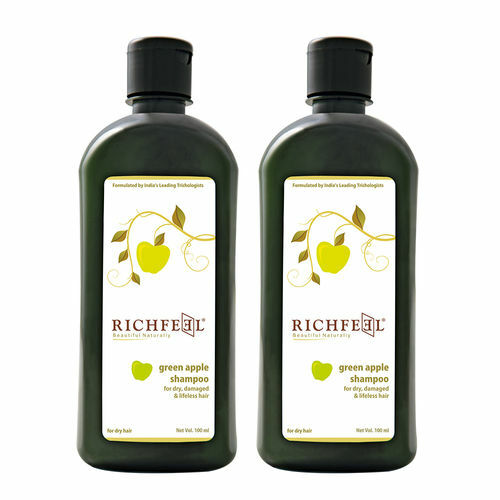 Richfeel Green Apple Shampoo is enriched with the goodness of Green Apple & is perfect for dry, damaged & lifeless hair. It retains hair moisture & makes hair look lustrous. Antioxidant properties of green apple ensure that your hair and scalp are cleansed for utmost purity. The shampoo effectively cleanses impurities and sebum without stripping your hair of all natural moisture balance. Bring your hair alive with Richfeel Green Apple Shampoo. Ingredients Green Apple Extract, S.L.E.S, Cocoamidopropyl Betaine, Coco Di-Ethenolamide, Cocomono Ethanolamide, Ethylene Glycol Monostearate, CI 42085, Preservatives & Purified Water. How to Use Apply shampoo on wet hair, keep it for 2 minutes & rinse with water. Repeat if required. Apply Richfeel Conditioner after shampooing. Special Features Enriched with the goodness of Green Apple.